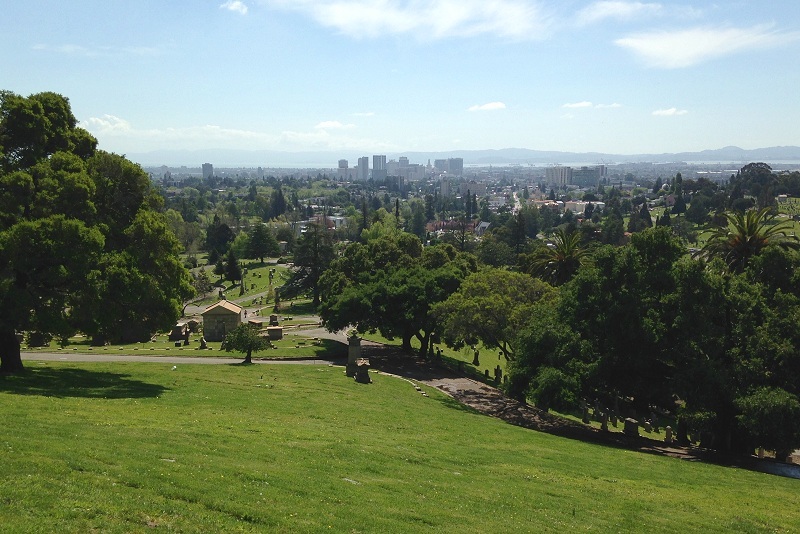 Although I’m tempted just to let the photos in this post stand on their own, let me make a case that Mountain View Cemetery offers the best landscape in the Bay area. First there’s the cemetery itself. 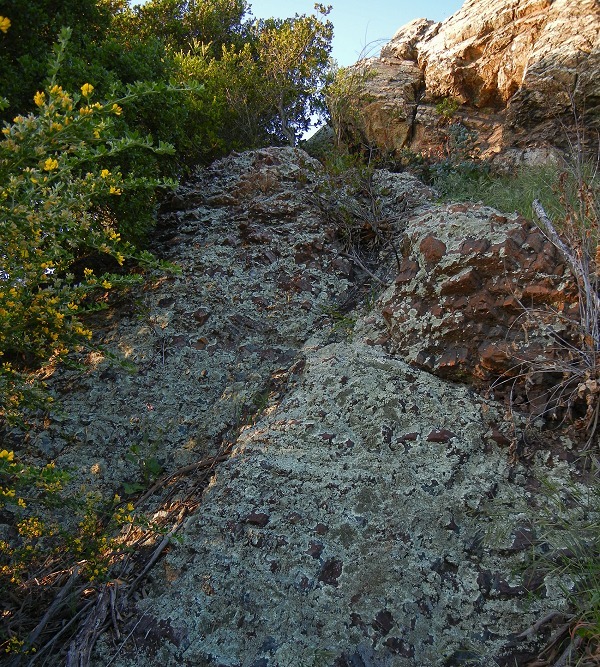 The managers have been putting a lot of effort into improving the ground — see the excellent new stonework and gravel path in the first photo — and this winter’s abundant rainfall has abetted it by giving the hills a coat of green that ought to last longer than usual before turning gold, then brown. 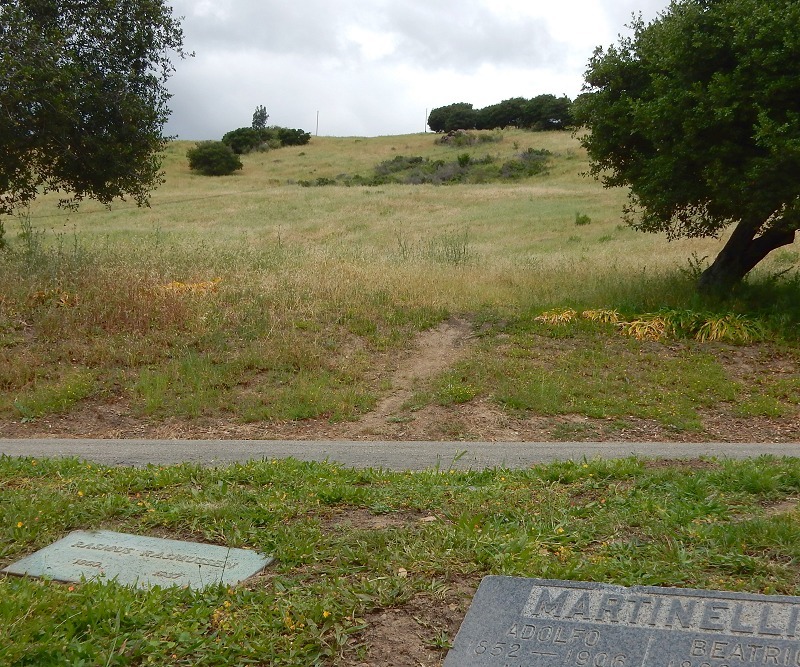 Unlike your typical cemetery, Mountain View is very large and occupies the rolling terrain of the Piedmont block, consisting of Franciscan melange. 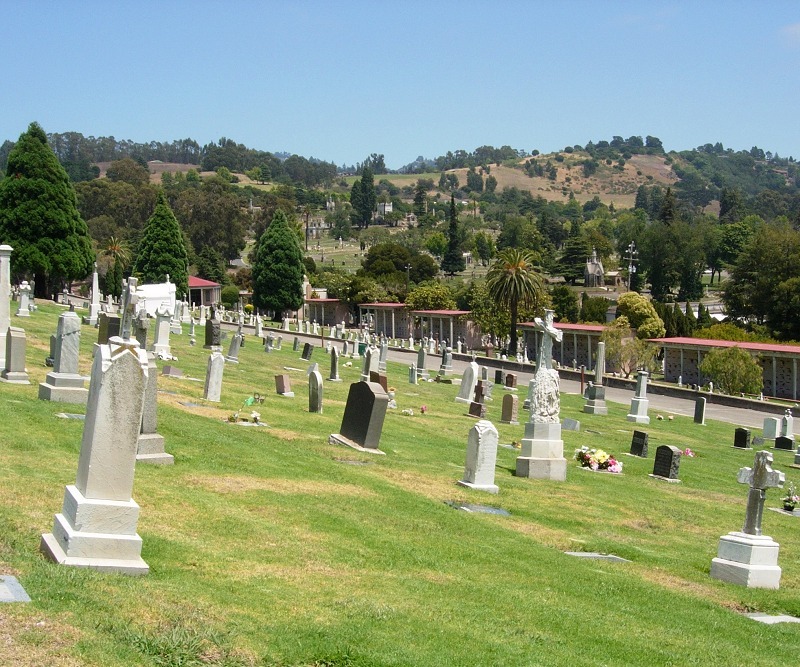 In the photo below, all of the land in sight lies within the cemetery’s property. 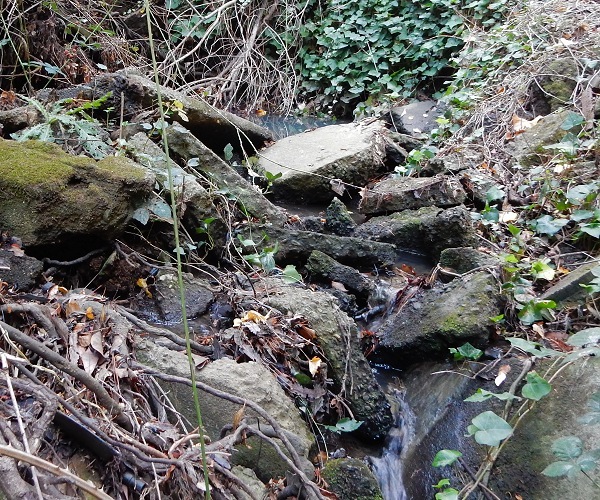 Long ago the operators arranged for Cemetery Creek (headwaters of Glen Echo Creek) to fill three ponds, where the water can be parceled out over the dry season to help keep the turf lush. Right now they’re brim full and support a few waterfowl. 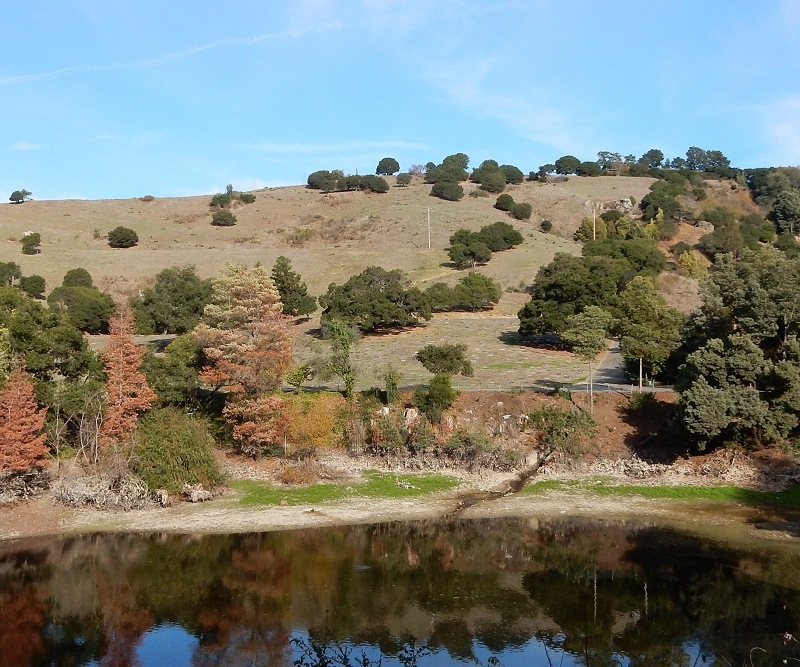 The open hilltop on the left side will be turned into a new section of graves under a proposed plan. 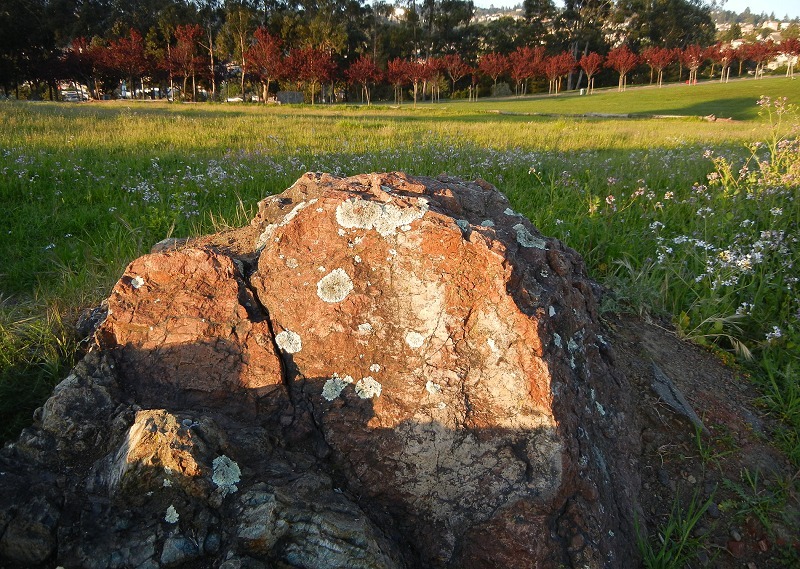 The Franciscan outcrops or “knockers” in the cemetery’s hills echo the finished stone displayed so touchingly in the grave markers. 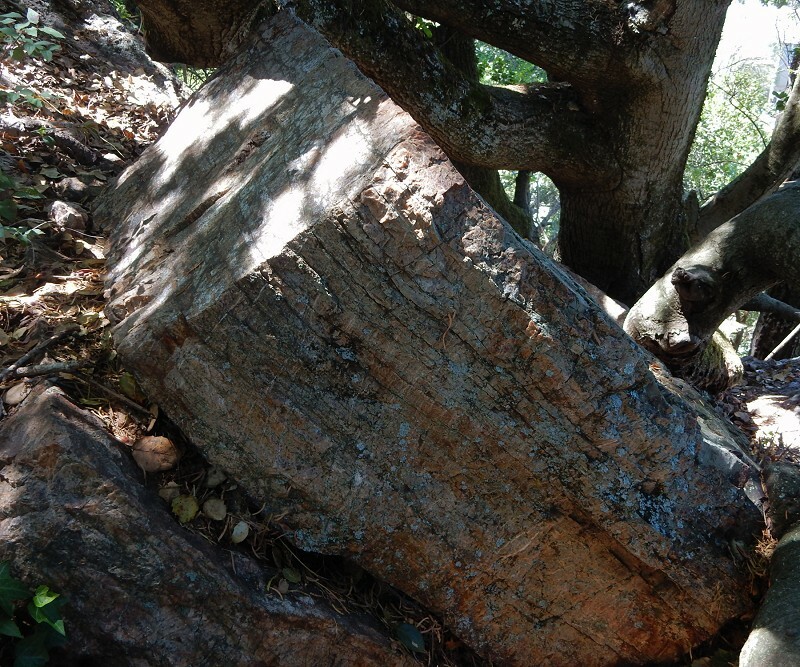 Many historical Oaklanders famous and obscure rest here. 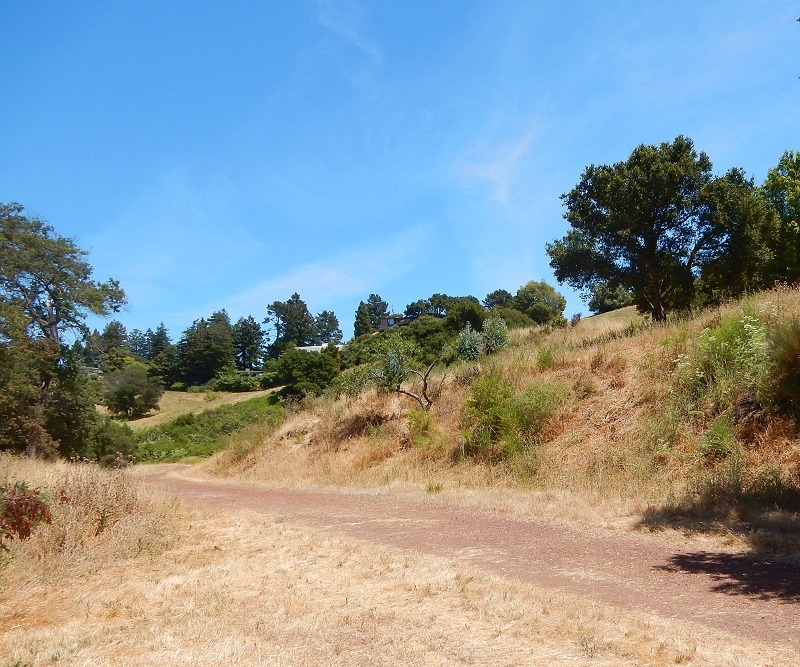 A random walk in any direction will bring up names that ring a bell if you’ve spent significant time in the East Bay. Yes, that’s what cemeteries are for, but without the graves this territory would be just another busy park. The dead ensure that the living visitors stay on their best behavior. And this is important — the delights of the cemetery don’t stop at its edge. 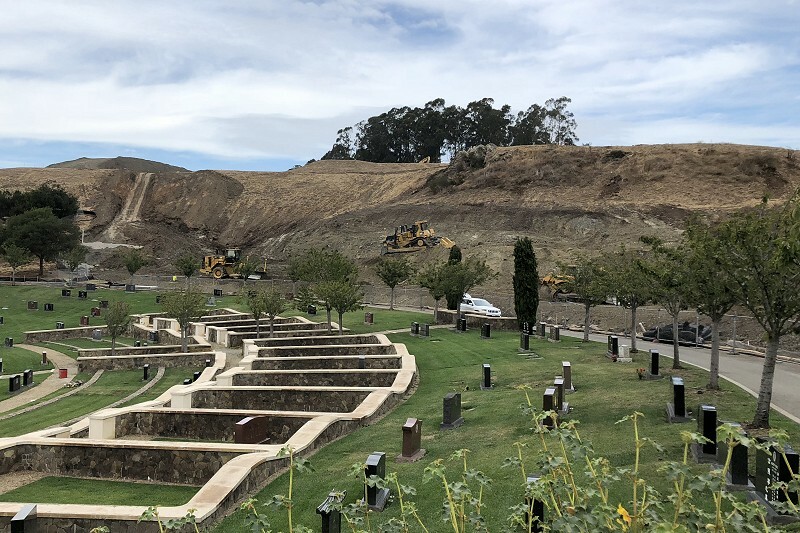 The east side has had its huge hedge of overgrown eucalyptus removed, opening the crest of the high hills and the well-tended neighborhoods of Broadway Terrace to view. 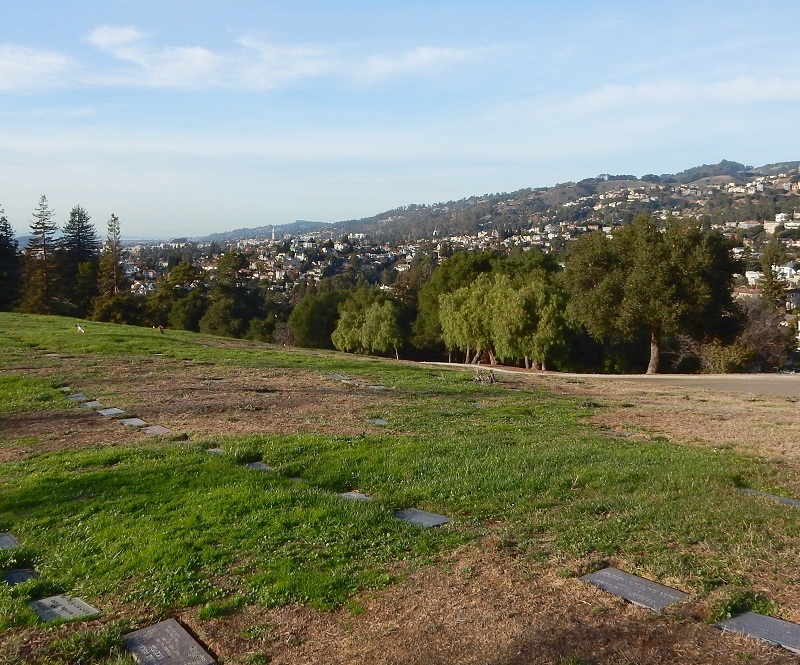 A few eucalyptus trees remain on the hilltop hosting the cemetery’s high staging area. In manageable numbers, their trunks are attractive as they frame views of tempting places. With the view east restored, there’s now a postcard vista in every direction you look. 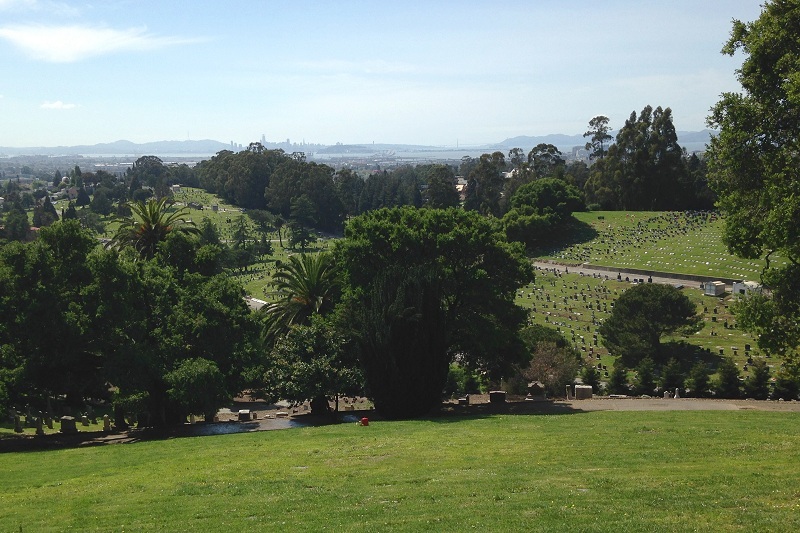 To the west you can see the Golden Gate, San Francisco, St. Mary’s Cemetery and Oakland’s outer harbor. 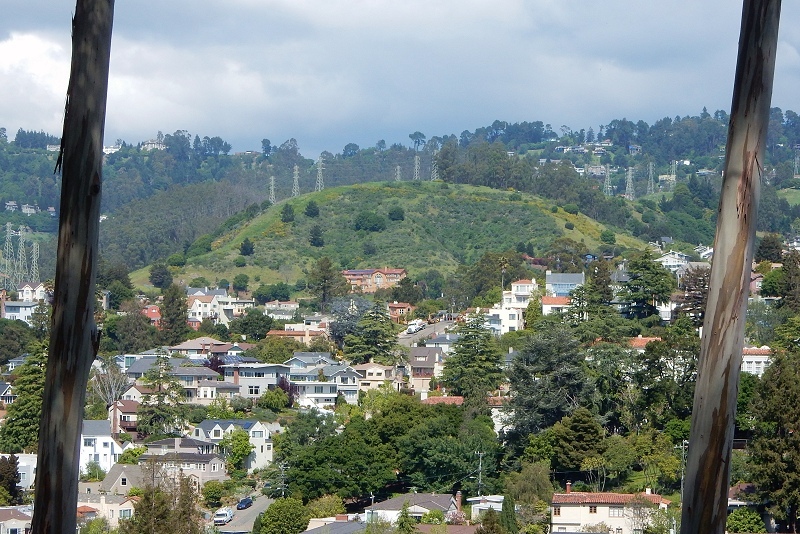 To the southwest is downtown Oakland and the ridges of the San Mateo Peninsula. These views, as well as those to the north and south, will always be unspoiled. 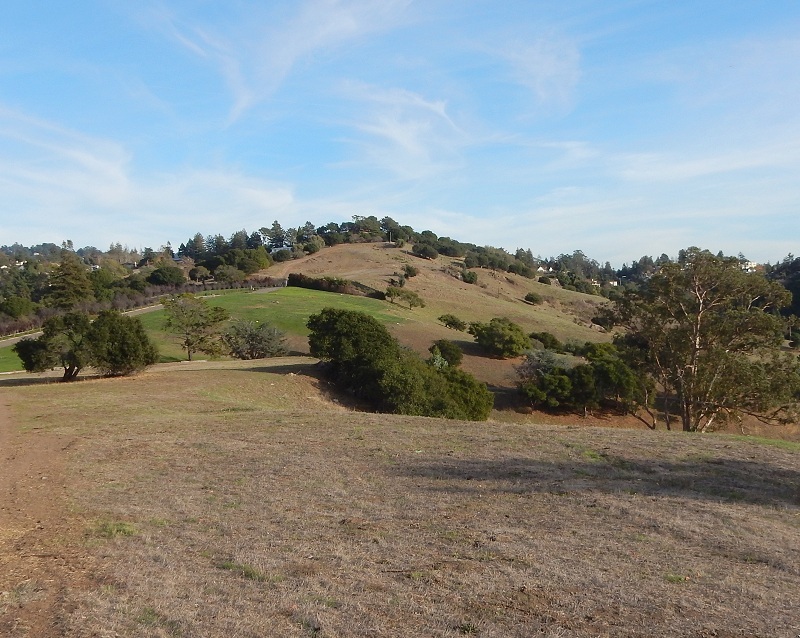 From Mountain View, one can take in surroundings that encompass a large share of the greater Bay area from the midst of a setting that’s both attractive and historic. So that’s my main case for this being the Bay area’s best landscape. 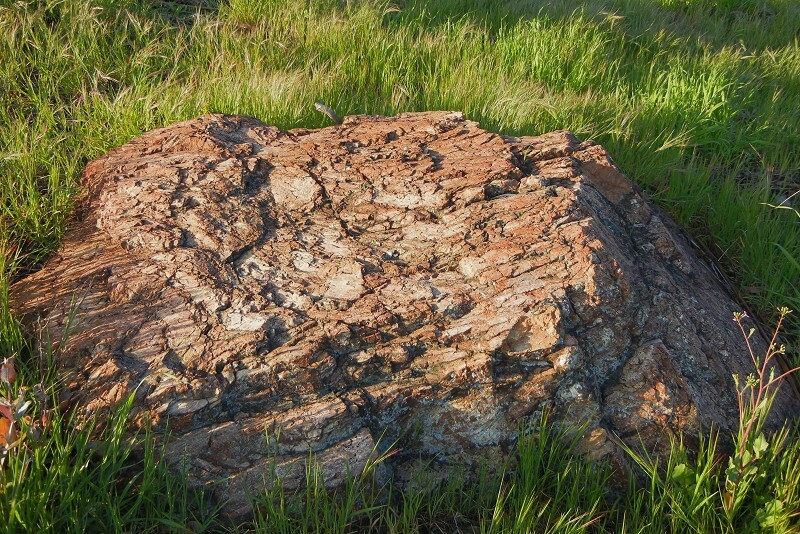 But there’s more — there are rocks. 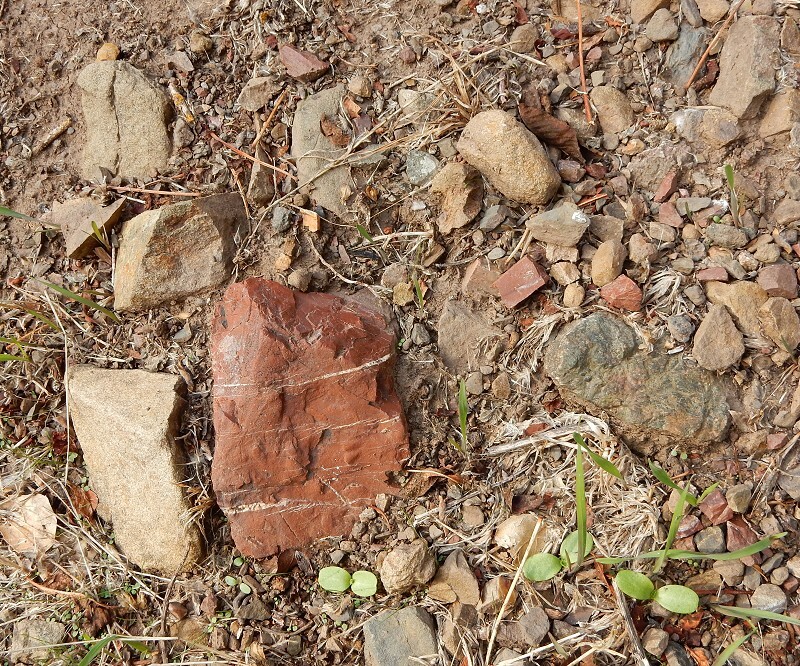 I always make sure to visit this outcrop of red-brown radiolarian chert on the hillside behind the garden mausoleum, plot 3. 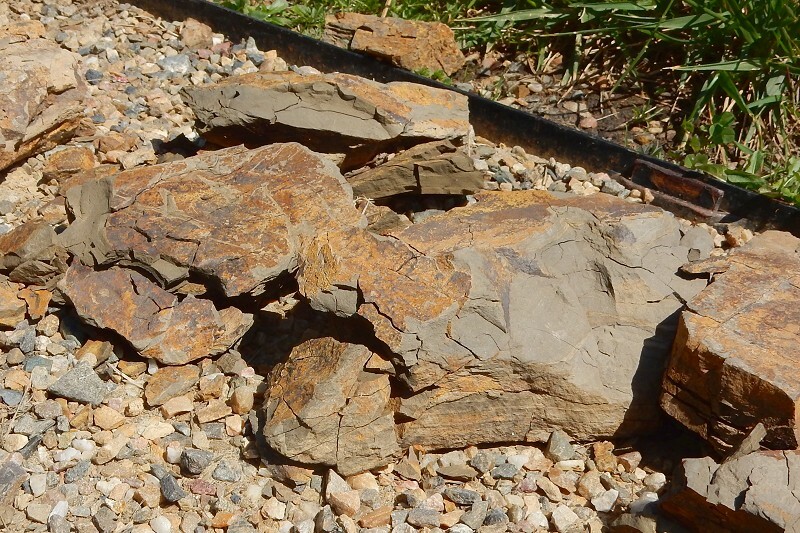 Other parts of the cemetery consist of shale, like this bit left behind from an excavation in plot 9. 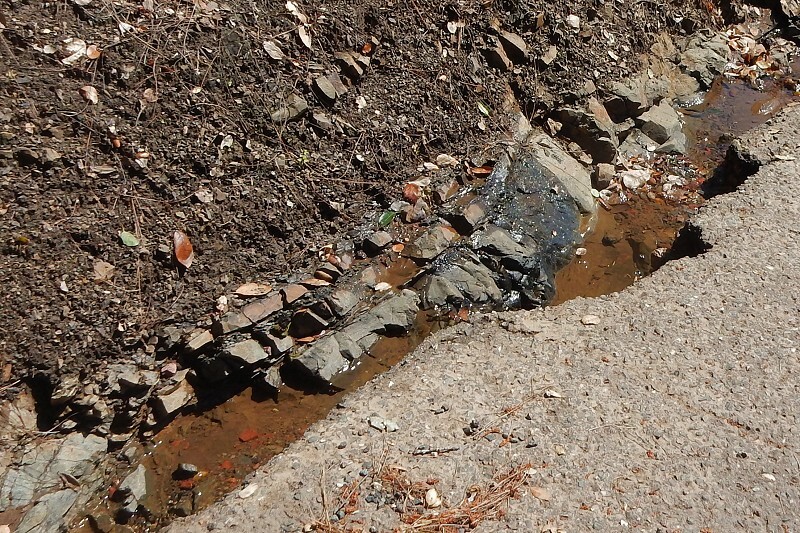 The road up to the top of the cemetery exposes some of the well-bedded mudstone that underlies much of the grounds, but look in the gutter for the freshest exposure. 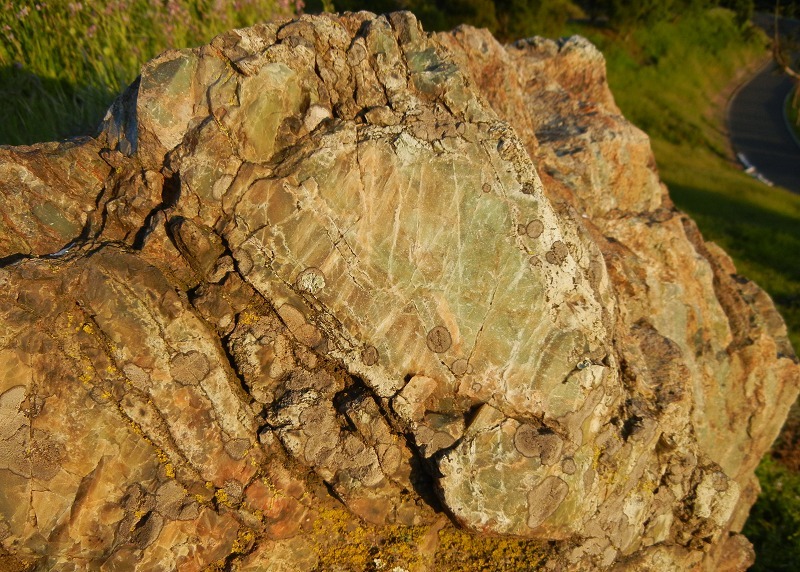 And once up there, make your way bayward from the northern tip of plot 77 to this outcrop of green and red chert. I’m glad to entertain arguments that one place or another might be superior to our cemetery. 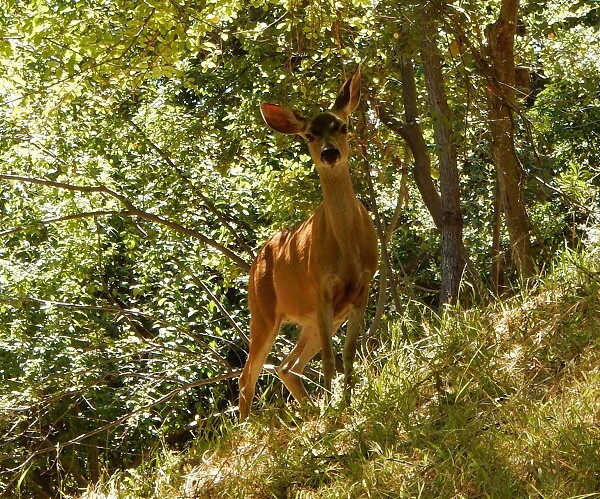 For sheer viewshed, Mount Diablo is a candidate, as is Tamalpais. 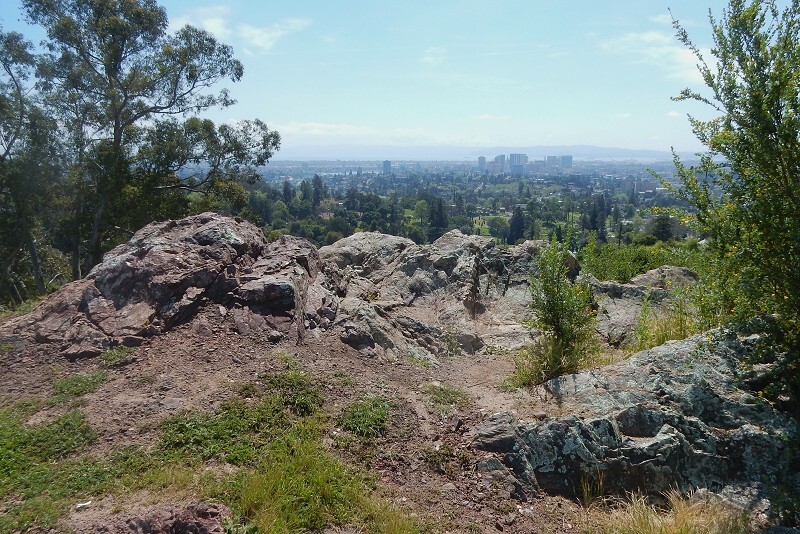 Twin Peaks in San Francisco gives excellent views of Oakland. 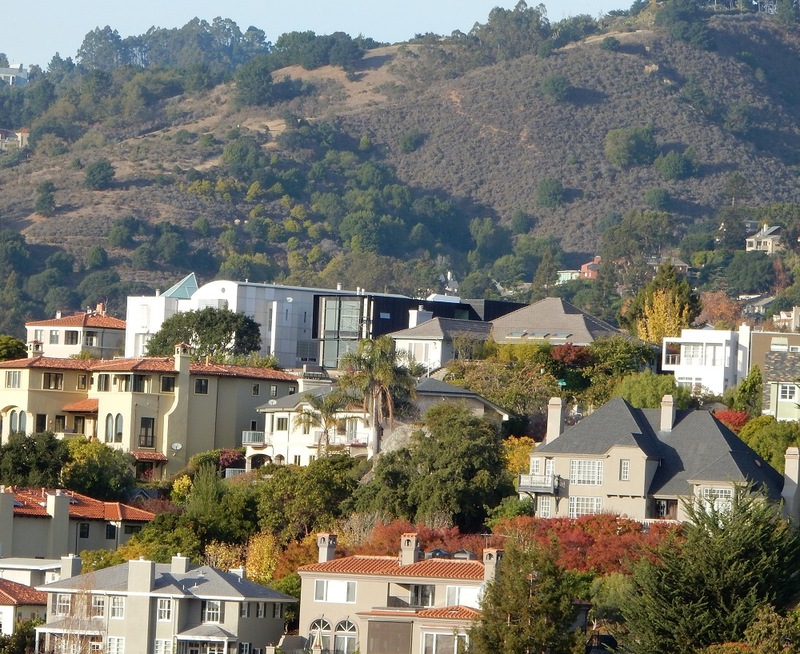 Mount Livermore, on Angel Island, is worth a special mention. 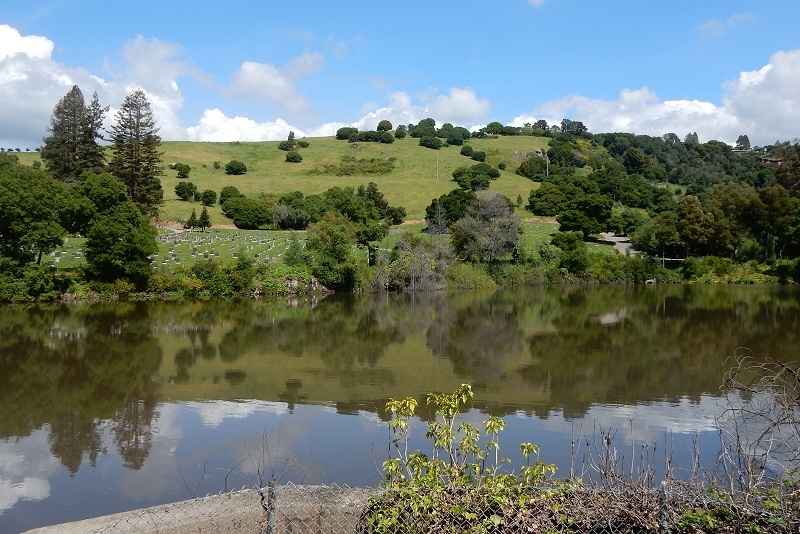 The South Bay and North Bay have many more picturesque places, not to mention the Peninsula. 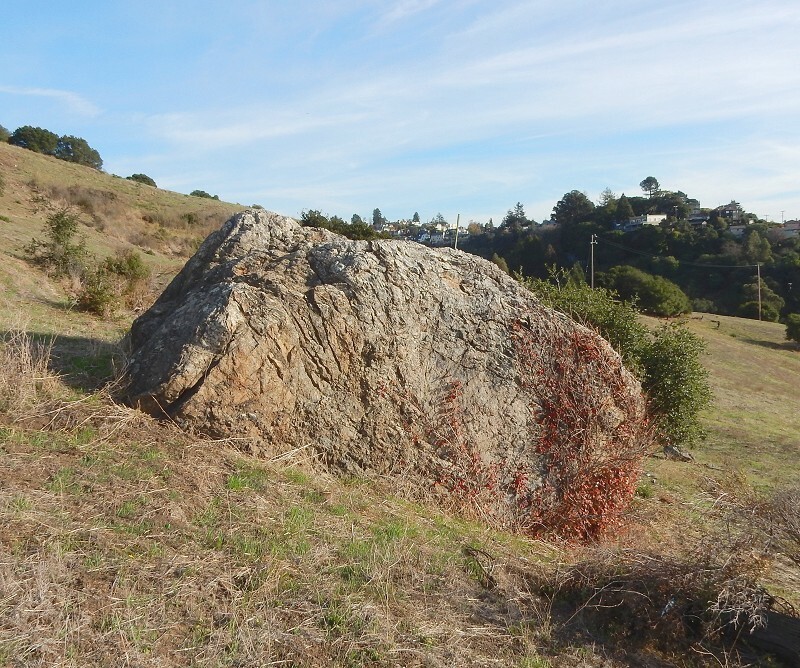 Lots of these spots survey a more spacious territory, but Mountain View surveys the most gracious territory, a viewshed of singular integrity that extends from infinity to your feet. In a region full of landscapes, this one offers as much elegance as it does grandeur. 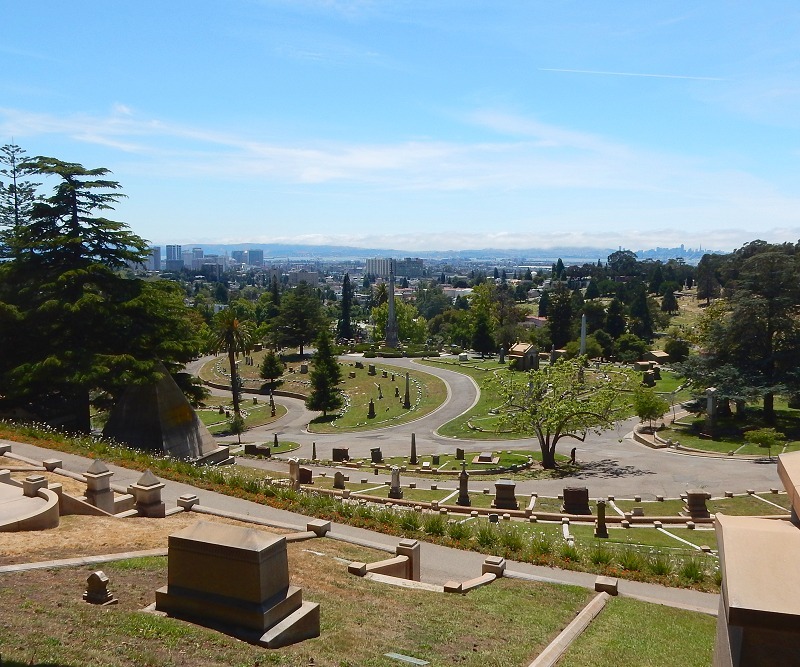 Mountain View Cemetery is one of Oakland’s great civic ornaments for several reasons: its gravestones and tombs commemorate generations of historically important Bay Areans, and its plan was Frederick Law Olmsted’s second significant large-scale project in landscape design after New York’s Central Park. 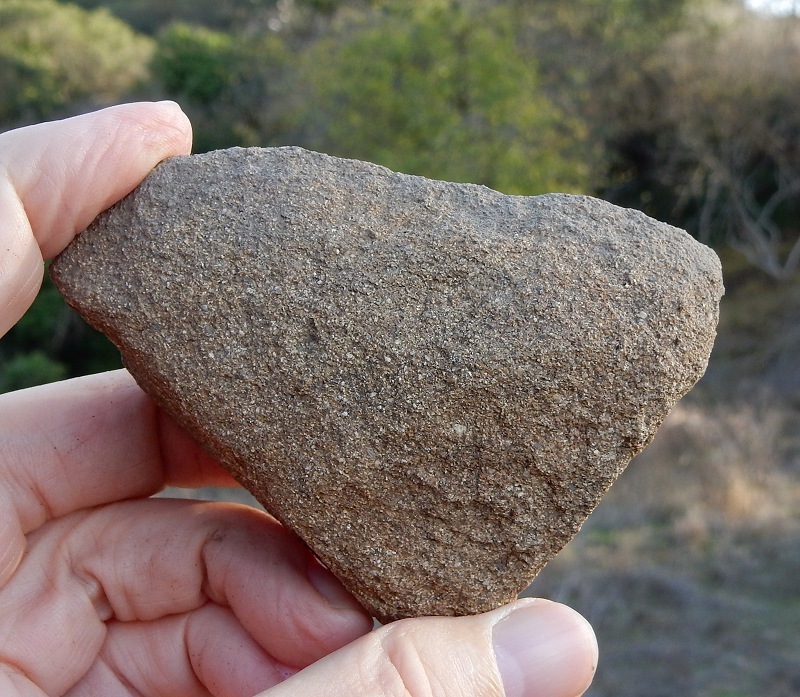 It’s a fine piece of open space that’s used by many different groups of people. 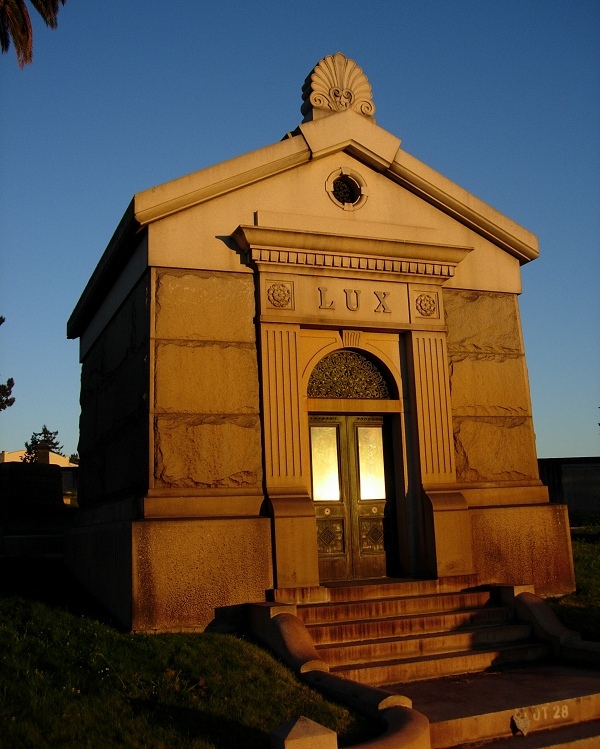 I think of the cemetery as a great civic ornament for two special reasons of my own. 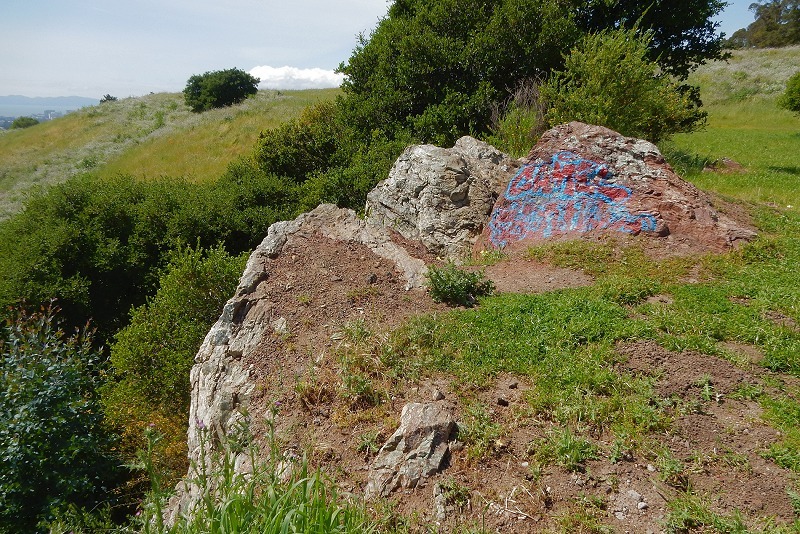 First, it’s a superb display of Oakland’s natural landscape as the first settlers knew it. 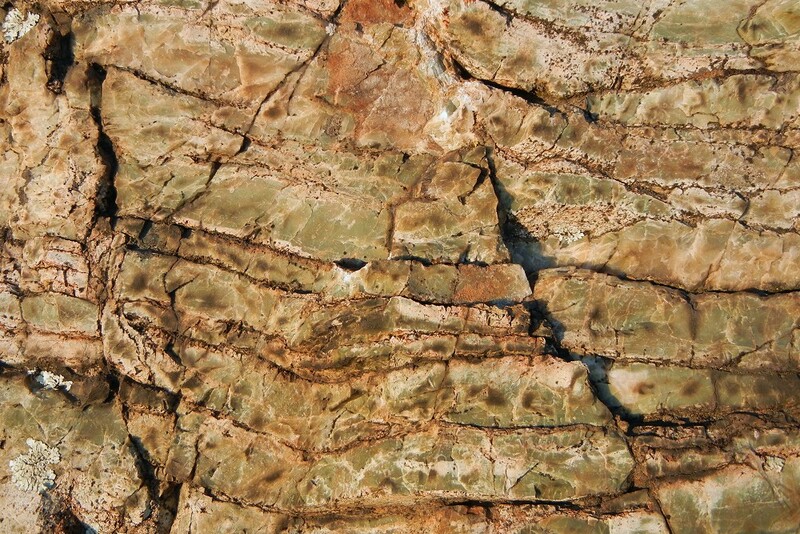 Second, it’s got some great exposures of Franciscan melange, the mixture of rock types that was created by the tectonic collision between the North America and Farallon plates about 90 million years ago. 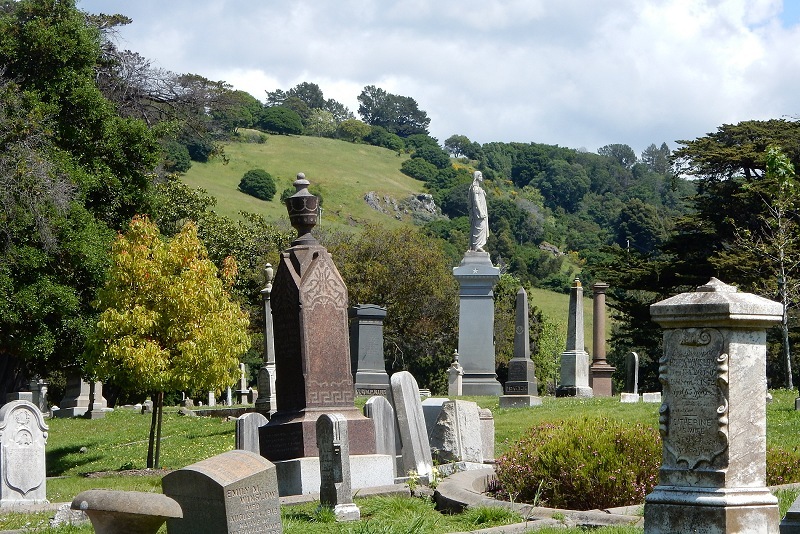 The cemetery’s operators are planning to reoccupy and develop the highest part of the grounds, the two heights in this photo taken from the Catholic cemetery next door. Here’s the view from up there. 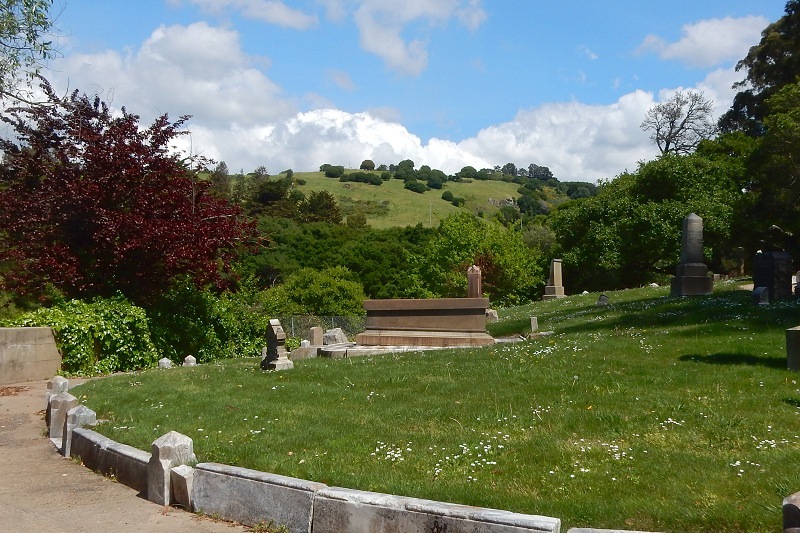 The cemetery proposes putting in roads and formal structures in the foreground and up on the hill beyond the fence, behind the greensward. 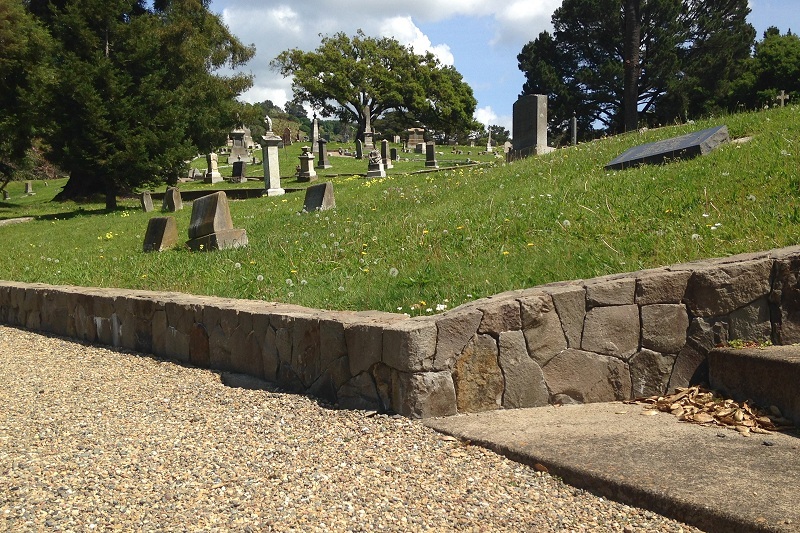 The goal is to accommodate about 1500 more grave plots. A lot of dirt and rock will be dug up and moved around. 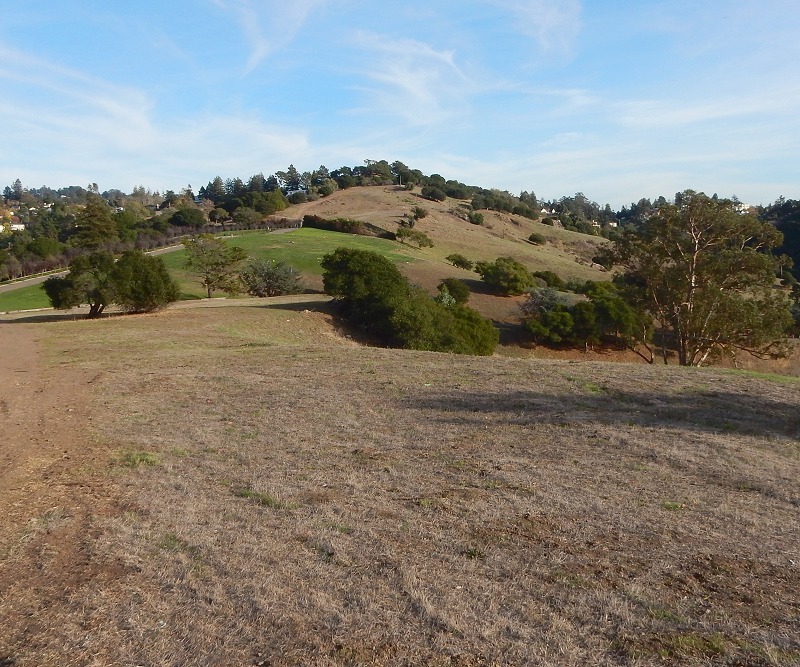 The plan talks of building up the hilltop and tilting it toward the bay for better views. The city’s master page for the proposed work is here. 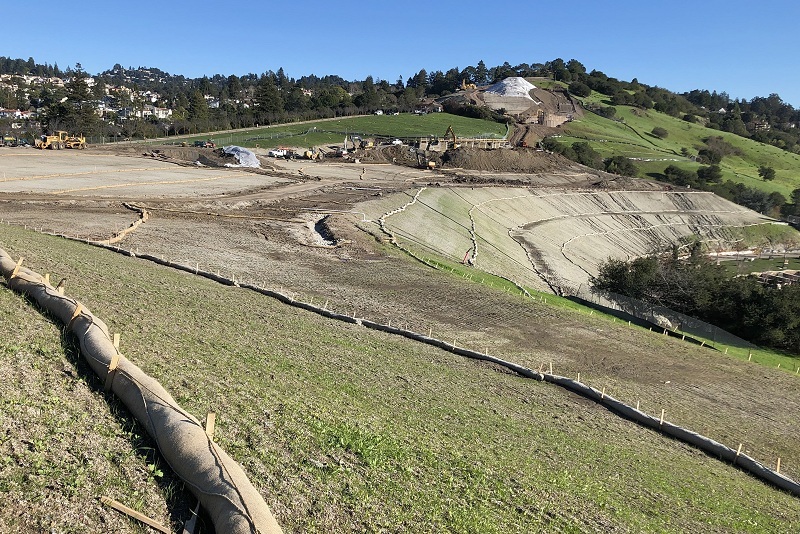 The draft environmental impact report is there, plus info on two upcoming hearings (July 11 for the Landmarks Preservation Board, July 20 for the Planning Commission). This month is the public’s most influential time window. The land beyond the fence is a special bit of countryside . . .
. . . with its own constituency. 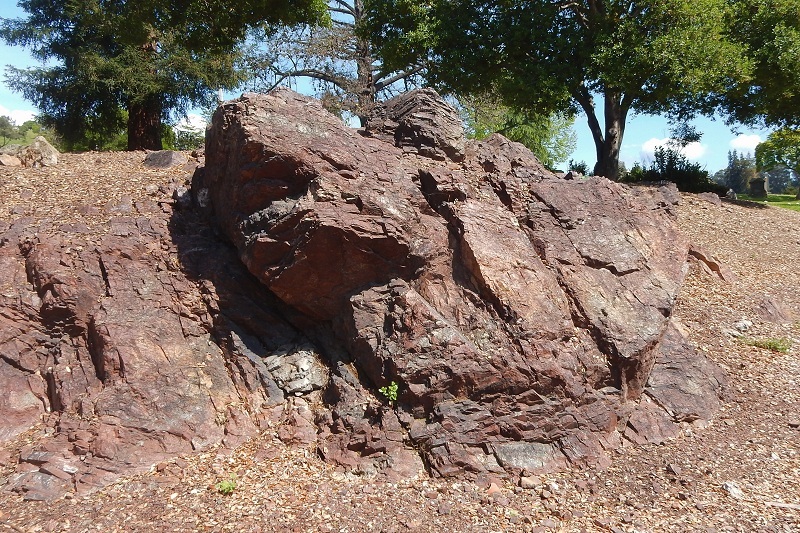 It also has its share of rock outcrops. To me these are precious things. 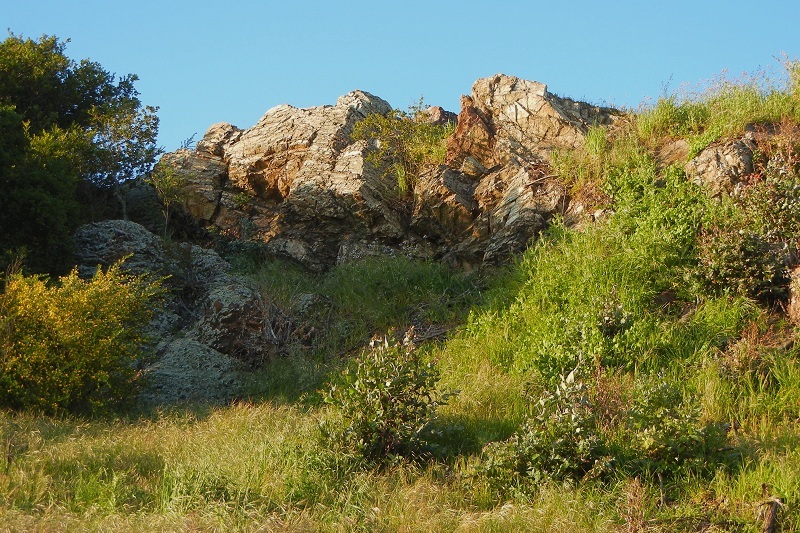 Most outcrops in these hills either were blown up during development or are locked up in people’s back yards. I’m still thinking about what I want to tell the city. 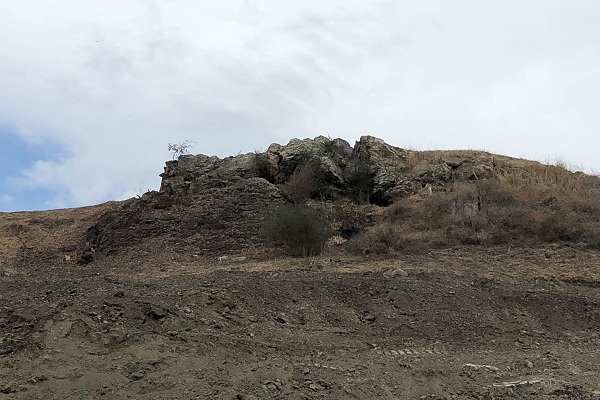 But my basic concerns are that the natural character of the land — its contours and vegetation — be respected and preserved as much as practicable. The project will affect a landmark that hundreds of thousands of people enjoy from their own windows and yards. Olmsted considered these hills the essential setting for the elegant, transformative parkland he planned here in 1863. 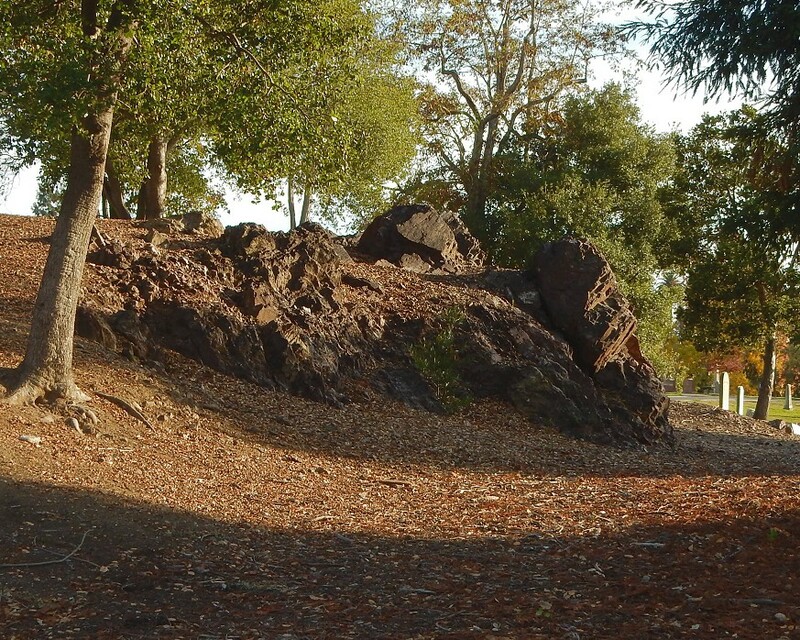 Mountain View was, and remains, an icon of the City Beautiful movement and a destination for landscape architects everywhere. 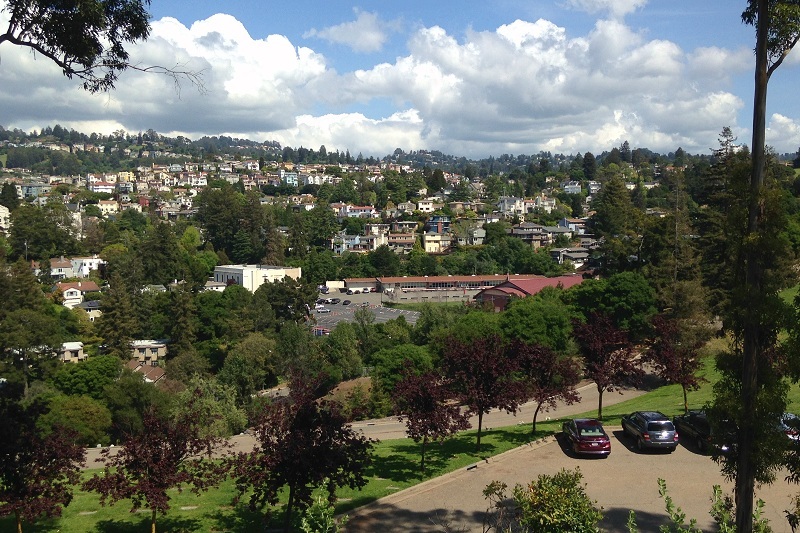 It and Stanford University (designed in 1888) are the only major Olmsted projects in the Bay area. 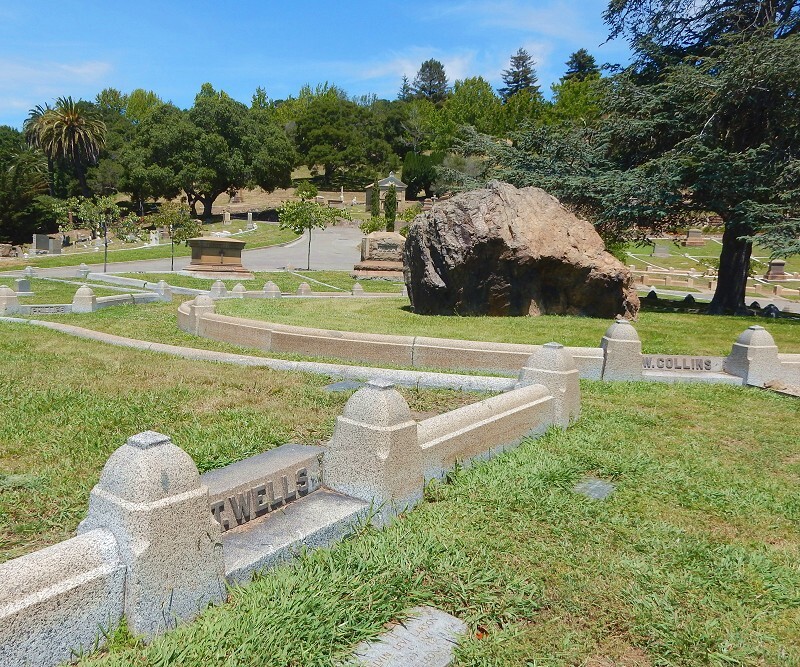 This amazing cemetery is Oakland’s cemetery. Let’s speak up to help keep it as beautiful as possible.